With assistance from Columbia Gas of Ohio, City of Delaware employees work to remove the 16-inch water main that ruptured Monday afternoon on King Avenue between West William Street and Blue Limestone Park. The rupture caused significant damage to the roadway. More than a dozen City of Delaware water customers are under a boil order advisory until 5 p.m. today, and King Avenue is closed for the foreseeable future following two separate, but related, water main breaks Monday afternoon on the city’s west side. Following an initial investigation, Lee Yoakum, community affairs coordinator, told The Gazette the city believes the culprit was an underground valve associated with a fire hydrant (damaged months back during a car accident) that was under maintenance near the intersection of Central and Euclid avenues. As a result of the increased pressure, the 16-inch water main on King Avenue, which Yoakum said was installed in 1960 and approaching the end of its useful life, ruptured. 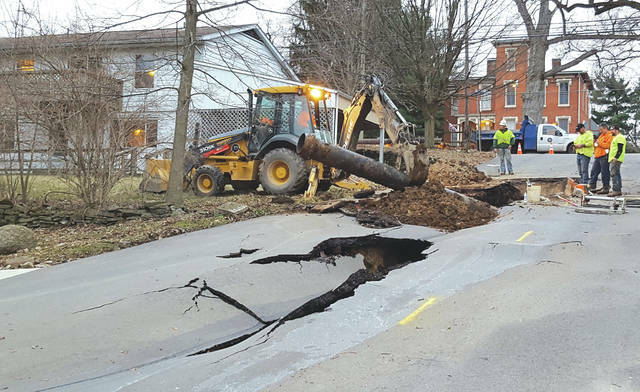 The rupture, he added, created a water “hammering” effect that led to a water main break at Euclid and Lincoln avenues. While water was restored to Lincoln Avenue residents around 7 p.m. on Monday and to King Avenue and West William Street residents just before midnight, 14 water customers in the affected areas have been notified to boil their water until 5 p.m. today. As for the impact of the breaks on city infrastructure, King Avenue became a sight to see for nearby residents and those who stopped by to snap a photo of the aftermath. Yoakum added the damage will require a “significant street rebuild” that likely won’t begin until after April 1 and could cost anywhere between $60,000 to $90,000 to repair. Until King Avenue is repaired, Blue Limestone Park will only be accessible from John Street. https://www.delgazette.com/wp-content/uploads/sites/40/2018/03/web1_Break-1.jpgWith assistance from Columbia Gas of Ohio, City of Delaware employees work to remove the 16-inch water main that ruptured Monday afternoon on King Avenue between West William Street and Blue Limestone Park. The rupture caused significant damage to the roadway.